“Evidence suggests that upward gas seepage (or gas charging of shallow sands) was happening naturally before gas well development. The implications of this conclusion are quite far reaching, especially considering that anti-fracking activists have long cited Pavillion, Wyoming as a linchpin in their campaign to shut down oil and gas development across the country. They have done this even though the claim has already been put to rest. As Energy In Depth has noted on many occasions, this story hinged on a single draft Environmental Protection Agency (EPA) report from December 2011, which theorized a link between hydraulic fracturing and water contamination. But EPA’s work was widely criticized by state and federal officials. For instance, when the U.S Geological Survey (USGS) conducted subsequent testing, they had more than 50 separate measurements that differed from EPA’s results. USGS also effectively disqualified one of only two monitoring wells used by EPA, due to low flow rates and poor construction. In an October 2012 meeting of the Pavillion Working Group in Riverton, Wyoming, the DEQ presented its “down-hole camera” investigation of EPA’s monitoring wells, which showed that EPA was not using stainless steel casing as it had claimed, but had rather used carbon steel. They also found drilling mud and cuttings at the bottom of the well. Both of these factors could have introduced contaminants. In response to significant criticism from federal and state regulatory officials, EPA withdrew its draft report from the peer-review process, and turned the investigation over to state regulators. The Wyoming DEQ’s findings come just as anti-fracking activists have called for the EPA Science Advisory Board (SAB) to recommend including Pavillion, Wyoming, as well as Parker County, Texas and Dimock, Pennsylvania in the agency’s study, which was released earlier this year. Yet in each of these cases, regulators and scientists have determined that hydraulic fracturing was not the cause of water contamination. Now, with this latest Wyoming DEQ study made public, the conclusions could not be clearer. Chesapeake Energy Corp. has increased its offering to convert its senior unsecured notes into as much as $3 billion in new second-lien notes, but even though the exchange offer was oversubscribed, the oil and gas producer still isn’t seeing much participation from the holders of notes coming due in 2017 and 2018. Oklahoma City-based Chesapeake announced on Wednesday, Dec. 16 that approximately $2.8 billion of its senior unsecured noteholders agreed to participate in the exchange by the early Dec. 15 deadline. The original swap was supposed to be unsecured debt for up to $1.5 billion in new second-lien notes. “This exchange is a bit of a prisoners’ dilemma, because if the noteholders don’t participate, they will get primed by the new second-lien debt and be junior in the capital structure, and those that do swap are doing so at a discount, but moving up the priority chain in the event that the company has future problems,” said George Schultze, the CEO of Schultze Asset Management, a hedge fund focused on distressed debt. He said that there is a good possibility that the exchange, which is a bit coercive, will go through, but noted that it won’t solve all of Chesapeake’s issues. Read that whole article by clicking here. The debt exchange has effectively eliminated roughly $1.5 billion in face value of unsecured debt and freed up approximately $770 million in liquidity prior to 2020 by pushing out the maturities of certain notes. However, I believe this to be just the beginning of an extremely opportunistic sequence of events in which Chesapeake (NYSE:CHK) will take advantage of the market's extremely pessimistic perception of the company and turn it into value for equity holders. While the first tender was oversubscribed to the tune of about $240 million, the second tender was undersubscribed by about $645 million. There are a few potential explanations as to why the second tender was undersubscribed. Since the exchange was only offered to eligible note holders, the pool of eligible note holders may have been largely exhausted at this point. Another reason for this may be the fact that certain note holders are holding out now in the anticipation that the reduction in total debt is positive enough such that the remaining note holders feel they have a much better chance of recovering the entire par value of their notes. The point of the debt exchange alone was never intended to solve all of Chesapeake's debt issues. The primary intent of the debt exchange was to extend maturities and reduce debt. The secondary intent was to weaken the relative positions of the unsecured note holders by establishing a large tranche of debt ahead of them in terms of priority to strengthen the negotiating position of Chesapeake's management. As we've seen, from the moment the exchange was announced until the results came out for the second tender offer, the value of Chesapeake's unsecured debt has dropped precipitously. This will allow Chesapeake to transition into its next phase of debt reduction before they make use of large asset sales. Continue reading that article by clicking here. Pennsylvania landowners who say they’ve been cheated out of royalty money by gas driller Chesapeake Energy are pleased with a lawsuit filed by Attorney General Katheleen Kane’s office, but still seek more legal protections. Oklahoma-based Chesapeake has been accused of underpaying royalty money in Pennsylvania and in several other states. Earlier this month Kane’s office filed a lawsuit against the company, accusing it of deceptive marketing practices. Although much of the focus has centered on Chesapeake, Root says she gets complaints about the royalty payment practices of other drillers as well. Her group has been pushing for new legislation to clarify Pennsylvania’s 1979 law, known as the Guaranteed Minimum Royalty Act. It requires oil and gas drillers to pay a minimum 12.5 percent royalty. This past year has been amazing for the Utica Shale in Ohio, as production of oil and gas in the state has more than doubled. At the end of 2014, EID reported that the counties to watch in 2015 included Monroe, Belmont, and Noble Counties — and we were right. Production results for the first three quarters of 2015 showed Utica Shale development trended south to these counties, and the best producing wells, particularly natural gas wells, have been located in these counties. But as we look ahead to 2016, one of these counties, Belmont, is where the real story of promise will lie. Why does Belmont County stand out amongst similar counties with high production? Well, it’s because Belmont County is by far the most diversified story in the Utica with a combination ofsurging production results, new permits to drill, proximity to roads, rail, and barges, and most importantly, a new multi-billion dollar ethane cracker. With all of these elements coming together, it’s fair to say that all eyes will be on Belmont County in 2016. With a site of nearly 500 acres along the Ohio River, including a 100 acre plant and a huge rail complex, it would be hard for anyone to wrap to their head around the sheer magnitude of the proposed $5.7 billion ethane cracker plant. To give some perspective, below is a picture of First Energy Corp’s coal-fired Burger plant, which will be the home of the proposed ethane cracker in Ohio. 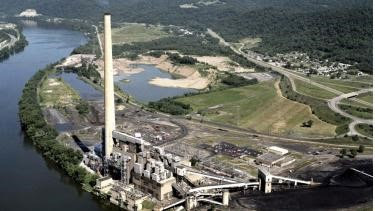 Retired Coal Plant: First Energy’s Burger Plant in Belmont County as it stands today. In 2010 the U.S. EPA forced the coal plant to shut down, taking with it needed jobs and tax revenue for the community and school district. The community was devastated, as unemployment stood at 13.8 percent following its closure. Five years later, thanks to shale development, this project would include completely removing the coal-fired plant and constructing a multi-billion dollar cracker, that that will be a “new promise for Belmont County” and bring thousands of construction jobs and hundreds of permanent jobs. In many ways, you can already see that “new promise” underway in Belmont County, as retail businesses, hotels, restaurants, and even a brand new Starbucks has arrived just within the last two years. Shale development has transformed one of the most economically depressed areas in the Appalachia Region – Belmont, Marshall and Ohio counties – into the fifth fastest growing economy in the nation, according to new statistics by the U.S. Department of Commerce. 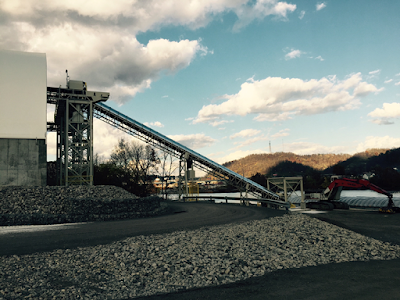 sand transportation loading operations in Belmont County. Local small businesses have come back to life and revitalized their strategies to start new endeavors, such as MPR Supply Chain Solutions, a company which has emerged as a leader in supportive services to the oil and gas industry in Belmont County. That includes a state-of the art transloading facility on the Ohio River for sand used in hydraulic fracturing, and a host of other supportive services for the Marcellus and Utica Shale industries in the region. Two years later, Malaikah’s prediction on the impact from shale gas has shown to be accurate. According to U.S. Energy Information Administration (EIA), Henry Hub spot prices for 2016 average $2.88 per million British thermal units (MMBtu) is 12 cents/MMBtu. Low feedstock costs, have brought about an increased demand for ethane crackers closer to the source, which is now the Appalachian Basin. So as we look forward to 2016, while Carroll County will continue to be a major player in the volume of Utica shale wells in Ohio, the real success story that will be making headlines is likely to come from farther south in Belmont County, where an intersection of core economically feasible acreage has resulted in tremendous natural gas production. Combine that with the easy access to roads, rail, and barges, and Belmont County becomes the ideal location on the Ohio River for real economic stimulus and long-term benefits for the community. The important thing to remember is that these jobs, infrastructure, tax revenues, and supportive industries are all a result of America’s oil and gas industry, or as a global investor recently called it, “U.S. shale gas economics.” Without record breaking natural gas production, Belmont County would simply not have realized the tremendous economic growth it has had in 2015 and it would not be in a position to look forward to a robust year ahead. While there has already been a tremendous positive impact to this region of Ohio, look for 2016 to be an even bigger year, as we watch this success story continue to unfold. View the latest weekly permitting update from the Ohio Department of Natural Resources below or download it by clicking here. The restrictions lift immediately under a provision in the spending and tax package that the president signed into law. Congressional leaders earlier in the week reached anagreement to end the trade restrictions, established during U.S. oil shortages in the 1970s, as part of a grand bargain that includes tax breaks for renewable-energy companies and refiners. What if your land was being taken for pipeline construction without your permission? For some in Huron County, that is exactly what they are facing as Spectra Energy plans to construct 36-inch pipes in its NEXUS Gas Transmission project. The project will transport natural gas to markets throughout the United States and Canada. This prospect had many landowners concerned about where that left their land as construction threatens to tear up farm land and uproot trees. For others, the pipes carrying flammable gases have been planned within 70 feet of their homes. You can read more by clicking right here. U.S. oil and natural gas producers have significantly less of their production hedged for 2016 than they did in 2015, and that lack of price protection could bring more financial distress, particularly for less-than-investment-grade companies, according to a report by Standard & Poor's Ratings Services. "Hedges represent 8% (1.619 MMboe/d) of total expected oil and gas production in 2016, a marked decline from the 15% hedged last year," S&P said Dec. 15. "The trend continues for speculative-grade companies, which have just 29% (1.437 MMboe/d) of total oil and gas production hedged next year compared with 45% in 2015." Among independent producers in the Utica and Marcellus shales, the group is deceptively well-hedged compared to the national peer group, an SNL Energy analysis found. "Deceptively" because while the majority of these producers, such as Antero Resources Corp., have more than half of their production hedged at prices above $3/Mcf, some major Appalachian drillers, such as Southwestern Energy Co. and Cabot Oil & Gas Corp., are going into the new year without any hedges. The companies that worry S&P the most have credit ratings of B or below, and the rating agency expects to see more defaults as 2016 goes on, particularly after lending banks finish up their credit redeterminations in the spring. View the latest weekly permitting report from the Ohio Department of Natural Resources below or click here to download it. IRVING, TX--(Marketwired - Dec 15, 2015) - Magnum Hunter Resources Corporation (OTC PINK: MHRC) and certain of its wholly-owned subsidiaries (collectively, the "Company" or "Magnum Hunter") today announced that they have filed voluntary petitions for relief under chapter 11 of the United States Bankruptcy Code in the United States Bankruptcy Court for the District of Delaware to facilitate the restructuring of their consolidated balance sheet through a prearranged restructuring plan. The Company also announced its entry into a restructuring support agreement with lenders that hold, in the aggregate, approximately 75% in principal amount of the Company's funded debt claims. Specifically, the parties to the restructuring support agreement hold substantially all of the Company's first lien debt, approximately 66.5% in principal amount of the Company's second lien debt, and approximately 79% in principal amount of the Company's senior unsecured notes. The restructuring support agreement contemplates the debt-to-equity conversion of (i) substantially all of the Company's prepetition funded indebtedness and (ii) 100% of the Company's contemplated postpetition debtor-in-possession financing (described below), resulting in a significantly deleveraged balance sheet upon the Company's anticipated emergence from the chapter 11 bankruptcy process in April 2016. In addition, the restructuring support agreement contemplates a significant cash recovery to vendors and trade claimants. Notably, the restructuring support agreement provides for debtor-in-possession ("DIP") financing in the form of a $200 million senior secured multi-draw term loan that will be backstopped by lenders who are parties to the restructuring support agreement -- further evidencing the lenders' overwhelming support for the Company's chapter 11 process. The Company anticipates that the DIP financing will provide sufficient liquidity to stabilize the Company's operations and satisfy key vendor, employee, and other key stakeholder commitments for the duration of the restructuring process, and, as noted, the DIP financing is expected to be converted to equity on the Company's exit from the chapter 11 process. The restructuring support agreement represents a significant achievement for the Company in the face of historic commodity price declines in both oil and natural gas and an increasingly depressed operating environment. Gary C. Evans, Chairman and Chief Executive Officer of Magnum Hunter, said: "With the unified support of our various lenders, we anticipate this restructuring will be a success and unprecedented in our industry. I believe this restructuring will position Magnum Hunter as a market leader in the upstream sector with an ideal capital structure to capitalize on the large number of opportunities anticipated in our industry due to the precipitous commodity cycle downturn affecting the industry as a whole." Mr. Evans continued: "At a very challenging time for the entire energy industry, when many of our competitors have been forced to either file for bankruptcy without a plan to emerge in place or continue to attempt to restructure with creditors without an 'end game,' our global restructuring accomplishment is definitely an outlier. We expect the entire process to be efficient, cost effective, and quick. We also anticipate emerging from bankruptcy financially stronger than ever before." Like many other exploration and production companies, Magnum Hunter's operations have been significantly impacted by the recent and continued dramatic decline in both oil and natural gas prices, as well as natural gas liquids prices, and general uncertainty in the overall energy markets. These macro-economic factors, coupled with Magnum Hunter's substantial debt obligations, resulted in the Company's decision to explore all strategic restructuring alternatives to reduce its overall debt and achieve a sustainable reconstituted capital structure. Magnum Hunter believes that its in-court financial restructuring as contemplated by the terms of the restructuring support agreement will position the Company for long-term success and ultimate profitability. Magnum Hunter also owns an approximately 45% equity ownership interest in Eureka Hunter Holdings, LLC. Eureka Hunter Holdings, LLC and its subsidiaries are not part of the Company's chapter 11 bankruptcy proceedings. Court filings and other information related to the restructuring proceedings are available at a website administered by the Company's claims agent, Prime Clerk, at https://cases.primeclerk.com/magnumhunter, or via telephone at 844-276-3026 (toll free) or 917-962-8497 (international). Additional information regarding the restructuring support agreement, including the conditions to the DIP financing and to the consummation of the restructuring plan, is contained in a Current Report on Form 8-K to be filed by the Company with the Securities and Exchange Commission later today. PJT Partners LP is serving as financial advisor to Magnum Hunter, Kirkland & Ellis LLP is serving as legal counsel, and Alvarez & Marsal North America, LLC is serving as restructuring advisor. Weil, Gotshal & Manges LLP and Houlihan Lokey are serving as legal counsel and financial advisors, respectively, to an ad hoc group of holders of the Company's first lien debt and second lien debt, in their capacity as prepetition lenders and postpetition DIP lenders. Akin Gump Strauss Hauer & Feld LLP and Centerview Partners are serving as legal counsel and financial advisors, respectively, to an ad hoc group of holders of the Company's first lien debt and senior unsecured notes, in their capacity as prepetition lenders and postpetition DIP lenders. Magnum Hunter Resources Corporation is an independent energy company engaged in the acquisition, production, exploration, and development of onshore oil and natural gas properties in the United States. The Company's current operations are principally located in the Marcellus Shale and Utica Shale regions of the Appalachian Basin, located in in Ohio and West Virginia. The Company also has interests in acreage and production in Kentucky and has primarily non-operating leasehold working interests in the Williston/Bakken Shale region of North Dakota. For more information about Magnum Hunter, please visit www.mhr.energy. This press release includes "forward-looking statements." All statements other than statements of historical facts included or incorporated herein may constitute forward-looking statements. Actual results could vary significantly from those expressed or implied in such statements and are subject to a number of risks and uncertainties. Although Magnum Hunter believes that the expectations reflected in the forward-looking statements are reasonable, Magnum Hunter can give no assurance that such expectations will prove to be correct. The forward-looking statements involve risks and uncertainties that affect operations, financial performance, and other factors as discussed in filings made by Magnum Hunter with the Securities and Exchange Commission (SEC). Among the factors that could cause results to differ materially are those risks discussed in the periodic reports filed by Magnum Hunter with the SEC, including Magnum Hunter's Annual Report on Form 10-K for the fiscal year ended December 31, 2014, and its Quarterly Reports on Form 10-Q for the fiscal quarters ended after such fiscal year. You are urged to carefully review and consider the cautionary statements and other disclosures made in those filings, specifically those under the heading "Risk Factors." Forward-looking statements speak only as of the date of the document in which they are contained, and Magnum Hunter does not undertake any duty to update any forward-looking statements except as may be required by law. The production of hazardous wastewater in hydraulic fracturing is assumed to be partly due to chemicals introduced into injected freshwater when it mixes with highly saline brine naturally present in the rock. But a Dartmouth study investigating the toxic metal barium in fracking wastewater finds that chemical reactions between injected freshwater and the fractured shale itself could play a major role. The findings, which are published in the journal Applied Geochemistry, show that transformation of freshwater used for fracking to a highly saline liquid with abundant toxic metals is a natural consequence of water-rock reactions occurring at depth during or following fracking. Fracking wastewater poses a hazard to drinking water supplies if improperly disposed. A PDF is available on request. The researchers examined samples from three drill cores from the Marcellus Shale in Pennsylvania and New York to determine the possible water-rock reactions that release barium and other toxic metals during hydraulic fracturing. The Marcellus Shale in the eastern United States contains large natural gas reserves, which have been extensively exploited in recent years using hydraulic fracturing. A mile below the earth's surface where fracturing takes place, chemical reactions occur between water and fractured rock at elevated pressure and temperature and in the absence of oxygen. Hydraulic fracturing is an important technological advance in the extraction of natural gas and petroleum from black shales, but produced wastewater, or water that is produced along with shale gas and petroleum following fracking, is extremely saline and contains extraordinarily high concentrations of barium. It has been assumed that the peculiar composition of the produced wastewater results from mixing of freshwater used for fracking with high salinity water already underground that also contains barium. But the Dartmouth team found that a large amount of barium in the shale is tied to clay minerals, and this barium is readily released into the injected water as the water becomes more saline over time. "Based on barium yields determined from laboratory leaching experiments of the Marcellus Shale and a reasonable estimate of the water/rock mass ratio during hydraulic fracturing, we suggest that all of the barium in produced water can be reconciled with leaching directly from the fractured rock," says senior author Mukul Sharma, a professor of Earth Sciences. "Importantly, barium behavior allows us to understand the behavior of radium, which is very abundant in produced water and is a very real environmental concern. There has been much discussion about injection of water with lots of toxic compounds during fracking. What is less known is that produced water is hazardous waste and chemical reactions between water and the rock are likely playing a role in its formation, not simply a mixing of freshwater with natural brines in the rock." The study was authored by Assistant Professor Devon Renock, Research Scientist Josh Landis and Professor Mukul Sharma, who is available to comment at Mukul.Sharma@dartmouth.edu. Halliburton Co. and Baker Hughes Inc. said Tuesday they now are uncertain that their merger will be completed because a timing agreement with the antitrust division of the Department of Justice (DOJ) is going to expire before reaching a settlement. The $34.6 billion merger announced in late 2014 would combine the No. 2 (Halliburton) and No. 3 (Baker) global oilfield service operators (see Daily GPI, Nov. 17, 2014). Halliburton is the No. 1 hydraulic fracturing provider in North America also. Since announcing their tie-up, the companies have agreed to sell assets to ensure they would pass antitrust muster. However, DOJ "has informed the companies that it does not believe that the remedies offered to date are sufficient" to address its concerns. The companies said they are continuing discussions with federal officials and remain focused on completing the transaction "as early as possible in 2016, but there is no guarantee that an agreement with the DOJ or other competition authorities will be reached." In that regard, Halliburton and Baker agreed to extend the transaction's closure to April 30, as permitted under the merger agreement, "though the parties would proceed with closing prior to such date if all relevant competition approvals have been obtained." The boards of both companies unanimously approved the agreement and shareholders of each company overwhelmingly voted for the transaction. Cera now serves on the state's 2020 Tax Policy Study Commission. According to commission data, Ohio collected about $20 million worth of oil and natural gas severance revenue in fiscal year 2015, up nearly four times from the $5.2 million it received the previous year. The 2020 commission will examine increasing the severance tax as part of an overall examination of Ohio's tax code. The commission is expected to make recommendations or propose legislation before the end of 2016. "I don't know if we'll be able to get anything through," Cera said. "I'll just keep advocating for it." Another matter of concern for Cera is the potential contruction of the $5.7 billion PTT Global Chemical ethane cracker in Dilles Bottom. He said this will create an even larger burden on local roads and infrastructure, as well as law enforcement resources. "We really need more money to improve our roads and bridges. If they build the ethane cracker, that will put even more traffic on our roads. It will also bring in a lot of people from out of the area," Cera said. As oil crashed through $35 a barrel in New York, some producers were already living with the reality of much lower prices. A mix of Mexican crudes is already valued at less than $28, an 11-year low, according to data compiled by Bloomberg. Iraq is offering its heaviest variety of oil to buyers in Asia for about $25. In western Canada, some producers are selling for less than $22 a barrel. Oil has slumped to levels last seen in the global financial crisis in 2009 amid a global supply glut. While the prices of benchmarks West Texas Intermediate and Brent hover in the $30s, they represent a category of crude -- light and low in sulfur -- that is more highly valued because it’s easier to refine. Some producers of thicker, blacker and more sulfurous varieties have suffered heavier losses and are already living in the $20s. View the whole article by clicking here. After years of protracted lawsuits, the Ohio Supreme Court heard oral arguments on Tuesday in a case that could release hundreds of landowners from undeveloped oil and natural gas lease agreements and cast doubt on similarly worded leases that have been used for decades in the state. Legacy driller Beck Energy Corp. has been fighting two groups of landowners over leases signed to explore for oil and gas in southern and eastern Ohio. The parties, including Beck's partner, XTO Energy Inc., have claimed the dispute has prevented millions in bonus payments, royalties and profits. The high court would decide if the leases signed with Beck are void because they include language to allow the company to perpetually control mineral rights without drilling. If the landowners are successful, a certified class of 700 of them could end their leases and negotiate new ones. In September 2011, five landowners filed a lawsuit in Monroe County Common Pleas Court against Beck claiming they signed lease forms, labeled G&T (83), that allowed Beck to control their land indefinitely without drilling and paying royalties if the company paid a few hundred dollars per year in rentals for the property. Beck argued those leases followed decades of precedent under Ohio law that allowed it to drill within 10 years of the lease and remain on the land as long as the company continued operations. The following year, the lower court ruled for the landowners and declared the leases void as a violation of public policy against leases that have no end date. EID previously highlighted Linzey and CELDF in an online video shedding light on just how extreme his organization has become. And Linzey may not be acting alone. According to a new report, a coalition of anti-fracking groups, including Greenpeace, 350.org and others, plan to launch a global civil disobedience campaign targeting oil and gas development in the new year. The Environmental Protection Agency engaged in “covert propaganda” and violated federal law when it blitzed social media to urge the public to back an Obama administration rule intended to better protect the nation’s streams and surface waters, congressional auditors have concluded. The U.S. ban on exporting oil may not live to see its 40th birthday. There's growing momentum to kill the restriction and a deal could be reached before the end of the year as part of a broader spending and tax bill that's making its way through Congress. Proponents argue the restriction is terribly outdated. It was signed into law on December 22, 1975 when the OPEC oil embargo created a shortage that slammed the American economy with skyrocketing prices. Today, the world has too much oil -- thanks largely to the American shale oil boom. That's why crude oil prices have crashed below $35 a barrel and a gallon of gasoline is on the verge of falling below $2 per gallon. In other words, there is no longer an oil scarcity that justifies keeping it at home. In fact there's too much of it. Oil prices won’t be affected by U.S. crude exports, according to OPEC’s top official. The U.S. Congress is nearing a deal on the biggest shift in the nation’s oil policy in more than a generation by allowing the world’s largest oil and gas producer to sell crude abroad. Pressure has been building to lift the ban as new drilling technologies unlocked reserves in shale formations, pushing output and stockpiles to records while punishing prices. “They export some, but they need to import the same quantity from somewhere else,” El-Badri said in New Delhi. The U.S may export light oil produced from shale formation while still importing heavier types of crude, he said. The oil and gas industry fears the Environmental Protection Agency may issue a new report that says fracking contaminates U.S. water supplies and is urging the agency to stick with the science of its original findings that shows no such risk exists. The Independent Petroleum Association of America sent a letter Monday to EPA Administrator Gina McCarthy pressing her not to give in to anti-fracking special interest groups that have been pressuring the agency to go against scientific precedent with a finding that fossil fuel production from shale poses systemic risks to the nation's water supply. Fracking, or hydraulic fracturing, is the process used to extract oil and gas from shale rock formations deep underground. Known as the shale revolution, the production technique has made the U.S. a top global producer of oil and natural gas in a few short years.